• July 29-August 2, 2019. 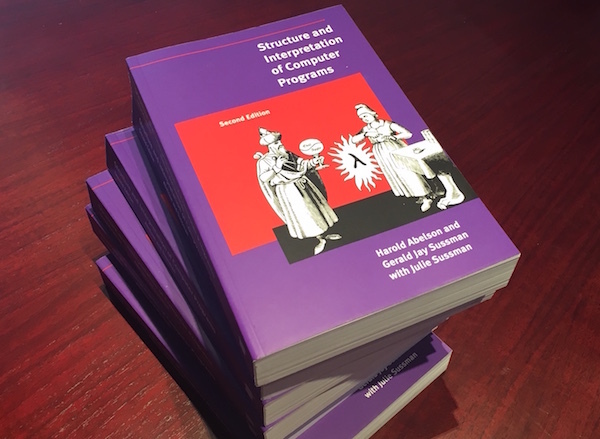 One of the most well-known textbooks in all of computer science is "Structure and Interpretation of Computer Programs" by Abelson and Sussman. This is the same book that was long taught to undergraduates at MIT and it's notable for offering deep insights to programmers at all levels. For undergraduates, the book introduces important concepts about computational thinking, algorithms, data structures, and complexity. At a more advanced level, the book explores the nature of computation, programming, and abstraction as it builds the foundation for creating your own programming language. In this intense week, we cover all five chapters of SICP with the goal of implementing our own LISP/Scheme interpreter and seeing how it maps to a machine. This involves a mix of problem sets from the book, coding in Scheme, and writing at least two different Scheme interpreters (one in Python and one in Scheme itself). We also take a side-trip into the land of lambda calculus and explore the foundations of functional programming. Why would you take this class? Because it's fun of course. Plus, you'll learn a lot of neat stuff and understand the programming languages you use now with a new awareness. "David Beazley's courses are always mind-expanding, mind-bending, and mind-exploding. The SICP course is no exception. If you want to learn the foundations of functional programming while having a fun week of intellectual exercise, look no further than this excellent course." This class is for experienced programmers who feel up to the challenge of going through one of the most well-regarded textbooks in computer science. For self-taught programmers, this course provides exposure to wide range of deep ideas from the core of computer science. This includes algorithmic thinking, computational complexity, and different programming models (e.g., functional vs object-oriented programming). If you've attempted to read SICP yourself and been stymied by its difficulty, this course will help you navigate the book in a manner that puts it in a more focused context. This course could also serve as a springboard for further study of functional programming languages such as Clojure, Erlang, Scala, or Haskell. This course is fairly faithful to the overall structure and organization of the SICP book. Each course day consists of a mix of prepared presentation, live coded demonstrations, discussion, reading, and time to work through selected book exercises. At various points, the course explores some extended side projects including the implementation of a Scheme interpreter in Python. The last two days of the course are mainly concentrated on implementing a Scheme interpreter in Scheme itself. Throughout the course, there is a significant amount of group discussion. This course is best suited for experienced programmers. No prior experience with Lisp or Scheme is required, but some familiarity with Python is strongly advised. Note: some of the examples in SICP involve symbolic algebra and calculus. Although the focus of this course is not on mathematics, be aware that certain exercises might involve polynomials, root-finding, and symbolic differentiation as an example. SICP consists of 5 chapters. This course aims to cover all of them. Chapter 1: Procedural Abstraction. This chapter provides the foundations for functional programming. Scheme programming is introduced and we discuss evaluation models, computational processes, and higher order functions. Chapter 2: Data Abstraction. This chapter introduces the problem of data structures and data abstraction. Some major themes include encapsulation, generic functions, types, and type systems. Special Topic: Lambda Calculus. We take a detour into the strange and magical world of lambda calculus. Heads explode in stunned wonder. Chapter 3: Modularity, Objects and State. The general problem of decomposing complex problems into smaller, more manageable components is discussed. One solution is to introduce the concept of objects and mutable state. Another solution is to introduce the concept of delayed evaluation and streams. We talk about both of those approaches and the ramifications of introducing mutability. Chapter 4: Metalinguistic Abstraction. This chapter teaches you how to build your own domain specific language. We primarily focus on the implementation of the metacircular evaluator--a Scheme interpreter implemented in Scheme itself. We'll then modify the interpreter to support lazy-evaluation. Chapter 5: Computing with Register Machines. This chapter describes how to map computational processes to actual machines. We'll discuss machine execution of iterative vs. recursive processes. We'll implement the machine simulator. Time permitting, garbage collection and compilation will be discussed. SICP in 5 days, are you crazy? When I taught SICP at the University, the goal was to cover the first three chapters and part of chapter four over a 10 week quarter in a class meeting 3 days a week, 50 minutes each session. That's about 25 hours of class time. Throw in a midterm, quizzes, waiting for people to show up, and everything else that goes along with a class and maybe it works out to about 20-22 hours of material. This course is being taught to six experienced software developers over five days (40 hours). Everyone will be so worked up that they'll go home each night thinking about it and working on it even more. On the whole, it's possible to cover most of the big ideas, code some exercises, and do some neat projects. One notable difference between this course and a university course might be a narrowing of the overall focus. SICP has a number of sections involving "puzzle problems" that stretch your computational thinking (e.g., solving the 8-queens problem) and extended examples that expose students to various topics in engineering and computer science (e.g., digital circuit simulation). These are great if you want to further explode the head of an undergraduate after hours, but not so practical in a week-long setting. We primarily focus on those topics that are directly related to the evaluation models, data structures, and objects needed to implement the Scheme interpreter in chapter 4. This makes the course most closely aligned with topics that might be covered in a "programming languages" class. This class is led by David Beazley. Although most known for his work in the Python community, Dave was formerly a tenure-track assistant professor in the Department of Computer Science at the University of Chicago where he taught a SICP course along with a variety of other topics in systems and programming languages. You might also know Dave from this somewhat infamous bit of live coding.